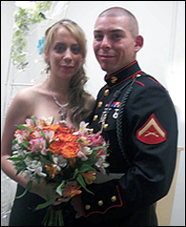 On April 2, 2012, USMC Sergeant Joshua Lopez of the 2nd Battalion, 5th Marine Regiment was severely injured in Afghanistan when he stepped on an IED. He was medivaced to Forward Operating Base Edi in the Helmand Province of southern Afghanistan after the incident. With constant pain and limited function in his right leg, Corporal Lopez opted to undergo a procedure to amputate the right leg rather than try to salvage the limb. He also suffered severe injuries to his left leg and right hand, and is being evaluated for TBI. He is currently hospitalized at Walter Reed National Military Medical Center in Bethesda, Maryland. Joshua and his wife Jennifer, along with their sons Joshua, Jr. and Jaden, were recipients of a home in San Marcos, California. Corporal Joshua Lopez with son Joshua, Jr.
Corporal Joshua Lopez, wife Jennifer, and son Joshua, Jr.
Corporal Joshua Lopez prior to his decision to have right leg amputated. Corporal Joshua Lopez is welcomed home by family.